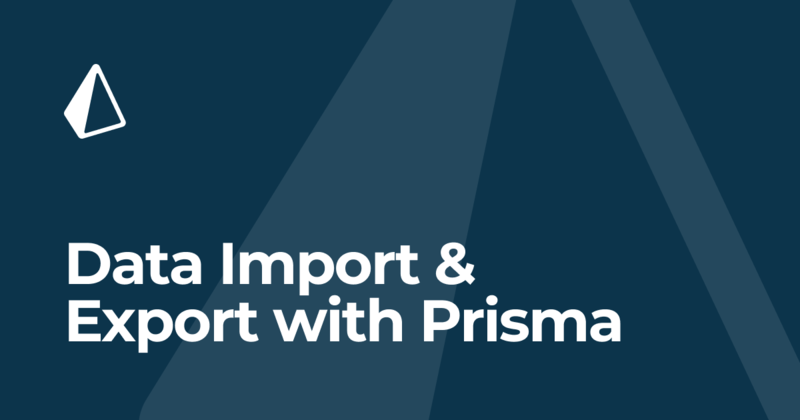 Prisma uses a dedicated, intermediate format for importing and exporting data: The Normalized Data Format (NDF). When prompted what kind of template to use, choose the Minimal setup: database-only one. This created a new directory called import-example with the root configuration file prisma.yml as well as the definition of the service's data model in datamodel.graphql. Next, you'll update the data model to also include a relation. Next, you're going to seed some initial data for the service. Now you need to tell the CLI that you created this file. You can do so by setting the seed property in prisma.yml. When deploying the service, the CLI will now send the mutation defined in seed.graphql to your service's API. "title": "How to GraphQL is the best GraphQL tutorial"
It's time to export the in the Normalized Data Format. This creates a new file called export-__TIMESTAMP__.zip where __TIMESTAMP__ represents the exact time of the export. The files in the zip directory are in NDF. To learn more about the structure, check out the reference documentation for the NDF. Next, you'll create "clone" of the service by deploying it to a new stage. Open prisma.yml and set the stage property to a new value. Also remove the seed and cluster properties! Run prisma deploy again to deploy the service the new test stage. Like before, when prompted where to deploy your Prisma service, either choose prisma-eu1 or prisma-us1. Now that the service is running, you can import the data from the zip directory! That's it! To convince yourself the import actually worked, you can open up a GraphQL Playground for the current test stage and send the above query again.